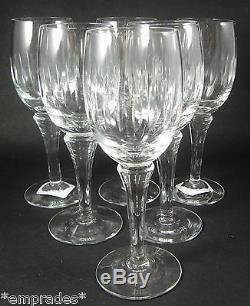 6 Vintage Holmegaard Leonora Red Wine Glasses. This elegant setting of 6 red wine glasses is in the design called Leonora designed by Christer Holmgren for Holmegaard Glass works Denmark and produced from 1964 until 1970. The crystal glasses are deeply cut to the bowl and have a plain stem and foot. 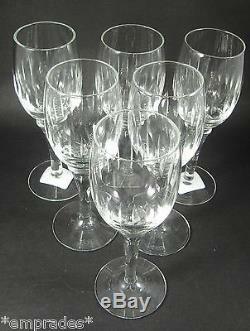 There is no damage to the set and all the glasses are sparkling and show no marks or clouding. The glasses are 17.5cm tall and measure 5.6cm across the rim. Please note this setting is also for sale in our shop Emprades vintage + design. You can also find us on facebook. For Imperial measurement users a handy guide is 25mm or 2.5cm is a little less than 1 inch, so 100mm or 10cm is just less than 4 inches. Please note this item is original and not a copy or modern day reproduction. We do not mark merchandise values below value or mark items as "gifts" - US and International government regulations prohibit such behaviour. The item "6 Vintage Danish Holmegaard Leonora Red Wine Glasses Christer Holmgren c1968" is in sale since Tuesday, March 29, 2016. This item is in the category "Pottery, Glass\Glass\Art Glass\Scandinavian". The seller is "*emprades*" and is located in Clarendon, SA. This item can be shipped worldwide.